You're making tomorrow's music... so why settle for yesterday's interface? 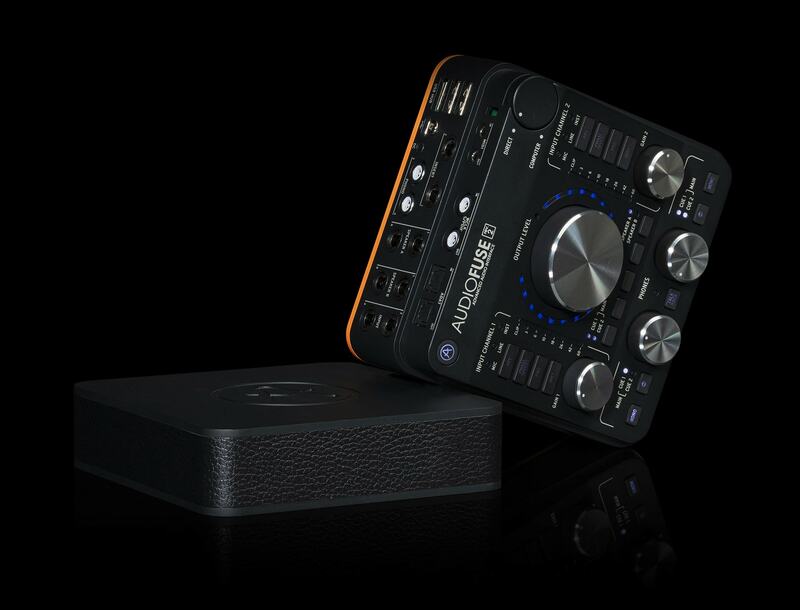 AudioFuse is the revolutionary next-gen pro audio interface that sets a new standard in sonic quality, creative production and value. It fuses the superior sound of high-end analog studio consoles with the flexibility of a solid mobile interface—with all the connectivity you need for any recording or performance. We put the same meticulous craftsmanship into AudioFuse as our award-winning software reincarnations of the world's greatest synths. AudioFuse is built on a fully symmetrical audio chain, with every stage carefully designed to culminate in unrivaled sonic purity. The two custom designed DiscretePRO® microphone preamps combine the best of yesterday’s vintage consoles with today’s cutting-edge technology, giving you and your music superior audio performance. Next-generation analog-to-digital converters deliver over-the-top audio quality with amazing transparency that reveals every nuance in your music. Add external line-level devices such as compressors into the signal flow before digital conversion. Connect any MIDI instrument or equipment with the supplied MIDI cable adapters. Sync any Word Clock equipment or connect to any S/PDIF digital audio device. Connect to any ADAT equipment with up to 8 digital inputs and 8 digital outputs. 3-port USB hub to connect your master keyboard, USB stick, dongle, and more. Connect AudioFuse to your computer, tablet or phone. Most features are available even with only the USB power supplied by a computer. Connect external phono or line devices to these RCA+ground and balanced 1/4” inputs. Connect two pairs of speakers to these balanced 1/4” outputs for easy A/B monitor switching. Direct access to each feature of analog inputs 1&2: input gain with VU-metering, true 48V, phase invert, -20dB pad and instrument mode. Direct access to each of the analog output features: output level with VU-metering, audio mix selection, mono mode, output dimming, mute, and speaker A/B selection. Enjoy zero-latency monitoring of the recorded signals and blend them into your mix. Direct access to each of the features of headphone outputs 1&2: output level, mono mode and audio mix selection. Press a button to communicate with talent in another room via the built-in microphone. Connect microphones, instruments or line devices to the 2 XLR/balanced 1/4” combo inputs. Don’t bother looking for a 1/4” or 1/8” phones adapter; AudioFuse has both connectors for each phones output.